Israel tries to wreck Christmas for Palestinians | Fight Back! 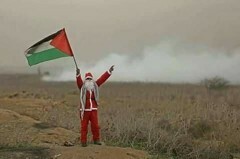 Minneapolis, MN – The Ma’an press agency is reporting, December 23, that once again Israeli authorities are refusing to give Palestinian Christians in Gaza travel permits that would allow them to celebrate Christmas with loved ones in other parts of Palestine, or to visit Bethlehem. In a related development, Israeli troops shot and killed four demonstrators in Gaza, Friday, December 21, in the latest of the Great Return March protests. Some of the protesters were dressed as Santa.